Philosophers from antiquity have reveled in the attempt to answer those questions we all wonder about. In this, his last book (under development at the time of his death), Professor Hawking—physicist and no fan of philosophy—does not flinch at tackling the Big Questions. Is there a God? is there other intelligent life in the universe? Will we survive life on Earth? Will artificial intelligence outsmart us? Those questions among others Hawking boldly and beautifully confronts. Is time travel possible? The author of A Brief History of Time, the book that brought worldwide fame to Professor Hawking, loved venturing into that realm. Einstein’s general theory of relativity allows time travel, he notes. In fact, it cannot be ruled out because of our present understanding of the laws of physics, even though logic contradicts them (for example, the possibility of coming home to kill our parents). Nevertheless as he explains, travel into the past may be possible by discovering ingenious ways of contorting the fabric of space-time—no small task, physicists would agree. But if time travel is indeed possible, Hawking asks why hasn't someone from the future arrived to tell us how to do it? With tongue in cheek, he once held a party at Cambridge for time travelers, but to make sure that only genuine time travelers came, he didn't send out the invitations until the day after the party. On artificial intelligence (AI) Hawking expressed doubt that humans in a distant future will have the capability to contain AI and prevent it from taking off on its own, having acquired an entirely different agenda from ours. On this point he was serious enough to have opened the Leverhulme Centre for the study for the Future of Intelligence, dedicated to the future of our civilization and our species and working on controlling AI as one of its missions. Professor Hawking believed that knowing the mind of God is learning and understanding all the laws of nature. His prediction: We will be there by the end of this century. 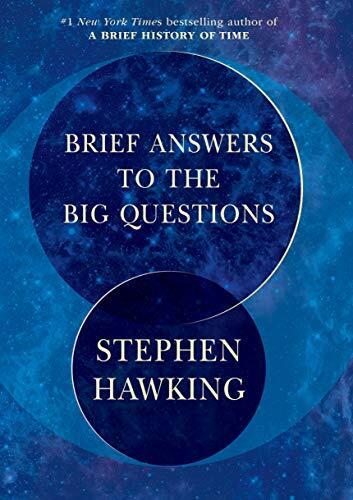 His succinct yet insightful Brief Answers to the Big Questions is a book highly recommended for anyone who has ever contemplated those questions, perhaps giving the reader a point of view never considered or even imagined. Such challenges to our own humble minds are among the reasons we read, ponder and explore. James Marshall Smith is a physicist and a novelist. His most recent book, Hybrid, was a short-list finalist for the William Faulkner-Wisdom Award and his debut novel, Silent Source, was an international finalist for the Clive Cussler Grand Master Award. An adjunct professor at Emory University in Atlanta, he was formerly a Distinguished Consultant/Scientist with the U.S. Centers for Disease Control and Prevention.